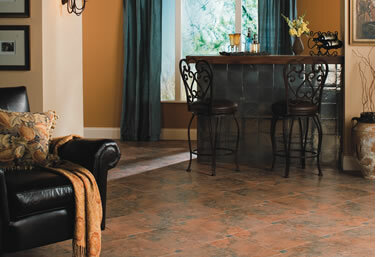 For all carpet, vinyl, hardwood and ceramic tile, check with manufacturer for recommendations. Old remedies do work – White vinegar and ordinary tap water, mixed 1/3 and 2/3, make a great stain remover. Keep the mixture in a spray bottle for quick and convenient access. Works wonders on stubborn stains like pet urine. Always dab, don’t scrub a stain! Use a wet/dry vac after dabbing or simply vacuum. Vacuum or sweep your floor daily to prevent dirt, dust and grit from scratching or dulling its finish. Blot up spills or spots with a lightly damp (well-wrung) cloth. Support furniture and heavy appliances with wide bearing, not staining glides or casters. For moving furniture or appliances into place slide them slowly over the floor on a clean piece of carpet (turned upside down). Place area rugs in high traffic areas to make long-term maintenance easier and less expensive. Do not use detergents and never pour water directly onto the floor. Natural stone requires a different maintenance routine than traditional man made ceramic tile. Many of the cleaners acceptable for use on ceramic tile can stain, damage, or dull stone. Dirt and dust will scratch the surface of stone. Therefore, stone floors should be vacuumed and dust mopped frequently to remove abrasive agents from stone surface. Natural stone should be cleaned with neutral cleaners. Stone cleaners should never include acid or bleach. Acids, even a light solution of vinegar and water will etch and eventually damage natural stone. Wipe glazed wall tiles periodically using a cloth or sponge dampened with non-abrasive household cleaner. Vacuum glazed floor tiles regularly to remove dirt and other gritty particles, and then damp mop or sponge with a water based all purpose cleaner. Wax cleaners and oil-based detergents may decrease the slip resistance of ceramic tile. Do not use ammonia, as it will discolor grout. Clean unglazed wall and floor tiles in a similar manner using a solution of water and soapless detergent instead of an all-purpose water-based cleaner. Best suggestion is to check with the manufacturer. Vacuum or sweep your floor daily to prevent dirt, dust and grit from scratching or dulling its finish. Our service department is a team of professionals who are available by appointment, to help you with repairs or replacements for any warranted and non-warranted concerns. We really listen to and value our customers. Contact us with questions.